So it's coming to the end of your big day and your wedding post box is brimming full and collected all of your wedding cards and gifts and kept them safe inside secured by the lock and key. But it's now time to wave a fond farewell to your post box at the end of the hire and you need a receptacle to transfer your generous family and guests' gifts and greetings in to. 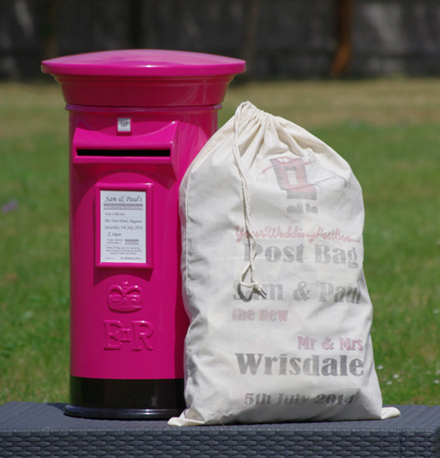 We can also supply you with a personalised post sack, a great fun solution and a fantastic keepsake from your day. Available to purchase to tag onto your hire post box from just £10.99 we can print with a "vintage" or "rustic" faded style print.